For a Man of Action. The Classic Shave with a Straight or Safety Razor. To shave or not to shave, that is the question; and it always has been, ever since man began to remove (or more precisely, scrape off) his own facial hair with the simple tools at hand, such as flint, mussel shells or shark teeth. Sometimes a beard was the thing, sometimes it was frowned upon, but wearing or not wearing a beard has always been a sign of social affiliations – and remains so today. It doesn’t take a genius or in-depth market research to notice that beard wearing has increased exponentially in recent years. However, anyone who concludes that this heightened hirsuteness has sounded the death knell for men’s care products needs to think again. In fact, due to the thoroughness of the shave, classic shaving methods, such as with a safety razor or even with a straight razor, are on the rise again, especially (but not only) when it comes to the shaping of contours. Every man, from the smoothly shaved to the fully bearded, would benefit, with some practice of course, from the use of a very sharp blade. The Straight Razor. Less is More. Shaving with a straight razor is, without question, the most primal and stripped down of all shaving methods. This fact alone does not make it better or worse than other methods, however. Rather, it is merely different and more challenging, but also the most thorough due to its immediacy. Another point in its favour: although acquiring one is not cheap, a straight razor produces no waste, and will accompany its owner for many years, if not for a lifetime, thereby proving it to be the cheapest and most sustainable option in the long-run. To get the razor in the correct position for shaving, open the blade until it is just about 270° from the handle, also called the scales. Between the wide blade and the pivot point, lies the slightly narrower shank, the top of which continues into the knife's back. The end of the blade shaft, which peeks out of the scales on the other side of the pivot, is called the tang. The number of fingers with which you hold the razor is a matter of personal choice. The basic position, however, provides that the shank should be held between the thumb and index finger – the former on the bottom (inside) and the latter on the top (outside). The middle finger, meanwhile, should rest on the top of the tang. Although this method offers the greatest possible flexibility, if you prefer to have a firmer grip on your razor, you can leave one or two additional fingers on top of the shank, starting from the index finger. The tang is then held with the ring finger and/or the little finger. Regardless of the finger positioning and grip, the optimum angle between the blade and the skin is 30°. A flatter angle tends to pluck the hair rather than cutting it, while a steeper angle increases the risk of cutting one’s face. Before each shave, it is essential to tauten the skin with the free hand. On the one hand this reduces the risk of injury and, on the other hand, the whiskers emerge much further from the hair sheath, resulting in a smoother shave. Once you begin to shave, take care to make long, quiet strokes from the wrist, with only a little pressure on the skin. The blade should always move in such a way that it remains at a 90° angle to the cutting direction. The first strokes should be done with the grain (i.e. in the direction of hair growth), a second sweep should go across the grain, and the last and finest shave should be against the direction of hair growth. If you have sensitive skin, it is possible to either dispense with the last step or skip the second step. After each turn with the razor, rinse the foam residue and hair from the blade or wipe the razor carefully on a fresh sponge or towel. This way you have a good view of the skin area still to shave as well as the beard contours you have already created. For a Smooth Running. Taking Care of Your Razor. The razor should be cleaned carefully after each shave. Rinse it thoroughly with clean water so that no bristles or foam residue remains. Then carefully dab the blade dry. Under no circumstances should you rub along the cutting edge, as this can damage the delicate burr of the blade that has already been affected by shaving. Always allow your razor to dry completely before storing it away. If your bathroom is particularly humid, it is a good idea to keep the razor in a different room to avoid rusting. If you do not use your razor for more than a week, rub the blade with a protective oil to keep water at bay. Before doing this, however, make sure that the blade is completely dry, as even the smallest quantity of moisture trapped under the oil can lead to staining and the formation of rust. To avoid the risk of any permanent damage to the blade, it is important to let the razor rest for at least 24 hours before sharpening, so that any given unevenness resulting from a shave can begin to right itself somewhat on its own. If you shave more than once a day, it is advisable to obtain a second razor so as to ensure adequate rest periods between shaves. When sharpening with a hanging strop, the strop should always be well-tensioned; otherwise, the blade edge can become rounded, thereby reducing the uniformity of your cut. The correct position of the blade on the strop is quickly learned. There are two things to keep in mind: 1) the angle between the blade and the hanging strop should always be extremely flat and 2) any change of direction should always take place over the blade's back. Place the razor on the strop, so that both the blade and the back are in contact with the leather. Now, with a small amount of pressure, move the blade backwards along the entire length of the belt. Then, turn the blade onto the other side over the back of the razor and repeat the same motion in the other direction. Ten to fifteen reps are enough to give the blade back its sharpness. If, at some point, despite the sharpening ritual described above, the razor begins to pluck the hair rather than cutting it when shaving, it is time to have it professionally sharpened. The Safety Razor. Staying on the Side of Caution. For many, the word safety razor may conjure up images of bygone days, associated with a rather ungentle and harsh facial treatment leaving the user wincing and covered in tiny tissue-covered cuts. 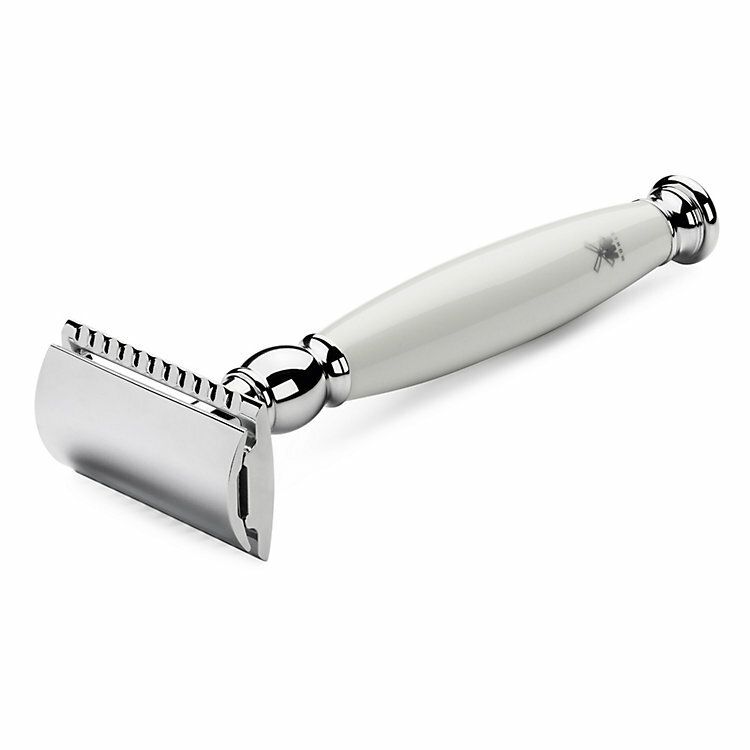 In fact, a safety razor is an extremely effective and precise tool. Concern about sensitive facial skin is therefore misplaced, since, due to the construction of the device, when properly used, it will remove only what should be removed. It is not for nothing, after all, that this kind of razor is known as a “safety” razor. For all those who shy away (for now) from trying a straight razor, staying on the safe side with a safety razor is perhaps the better choice. In principle, a safety razor is nothing more than the archetype of the electric razor. In contrast to modern system razors, however, it works with classic double-edged razor blades, which are clamped into the head of the razor. Since these razor blades have to be changed regularly, using a safety razor, in contrast to a straight razor, does produce some waste, which in the long run makes them less cost-effective. In comparison with system blades, however, they are more cost-effective and more environmentally friendly, because classic razor blades are made entirely of metal and do not require plastics. Good razor blades are also much sharper than system blades and can be resharpened as well. Sharply Observed. The Difference Between Safety Razors with Open and Closed Combs. For the uninitiated and those with sensitive skin, a safety razor with a closed comb is, without doubt, the best bet. With a closed comb, the blade edge in contact with the face is smoother, leaving the skin less irritated. In addition, the risk of cutting oneself with a wrong move is reduced because of the narrow blade gap, especially when compared to the open comb. Indeed, due to its indirectness, this variant is most comparable with a system razor. An open comb, on the other hand, has clearly visible teeth – the edge that comes into contact with the skin is therefore jagged. The distance between the blade and the comb offers greater latitude here, which is helpful when tackling dense, longer and wiry bristles. Those who don’t shave daily are better advised to try this model. However, contact with the skin is also more direct due to the open toothing, which leads to a potentially higher risk of injury. In the case of a razor with an open comb, it is even more important to maintain the correct angle to the face, which is 30°, or exactly the same as when shaving with a straight razor. For all that, the open comb razor rewards with an extremely satisfying and thorough shave. Finally, there is the angled-blade safety razor, the most aggressive of the three variants, the result of which is closest to shaving with a straight razor, and whose use also requires the greatest possible skill. In contrast to a classically shaped, open or closed comb, the razor blade sits at a slight angle in the head of the safety razor, whilst in the case of a torsion razor, it is additionally held in place under tension by a slight twist. The result: although it has a stroke equivalent to the other two models already mentioned, this variant captures the hair at a better angle, so that it is not only clipped but, through the oblique angle and motion, really cut, which once again improves the result. This is particularly effective on tougher stubble and wiry facial hair. Although product descriptions may be helpful and informative, the best way to make your own judgement may be to move, step by step, from one variant to another to slowly but surely get a feeling for this kind of shaving, thereby finding out which type gives you the result you need. Regardless of the model: after each pass with the razor, you should rinse off the foam and any remaining bristles from the blade, as they will otherwise clog the shaving head. Shaving should be something that is done in the same way a straight razor is applied to the face, without pressure, even if you feel that the sharpness of the blade is fading. At the very latest when it starts to tug at the hair rather than cut it, you should change the blade – which is on average every eight to ten shaves. A Close Thing. Deciding Between a Straight Razor and a Safety Razor. No matter what shaving method you choose – whether with a straight razor or a safety razor – both are not only extremely thorough; they also exhibit an almost meditative character as well as a high aesthetic appeal. It is not without reason that the classic wet shave plays an important role in many films, both old and new. Indeed, the appearance of a razor in the James Bond film "Skyfall" significantly boosted sales figures. Not that we want to use the original beauty of straight razor shaving as the main argument for this method, but it is undeniably an attractive side effect. And for all those who, despite all of the arguments mentioned above, still prefer a system shaver – after all, all men are different, as are their shaving needs – we offer a stainless steel model, which also transforms this method of wet shaving into a stylish pleasure. It goes without saying, however, that, when it comes to shaving, no matter which method is chosen, every man should possess a good shaving brush and a soothing shaving soap. Indeed, these shaving implements will only be given a chance to properly shine when they are used together with the right kit, thereby turning shaving into an art.